Right at the Kristberg cable car mountain station you will find the access to the 9,3 km long panoramic cross-country trail for classic cross-country skiing on the Kristberg. 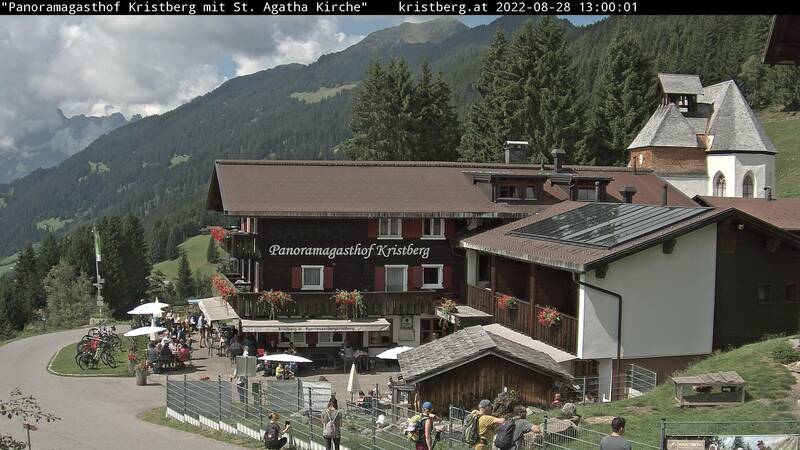 The best thing: you have a direct access to the trail from your cross-country hotel, the Kristberg Panoramagasthof. If you love the classic cross-country skiing style then you will have a ball on the panoramic trail on the Kristberg. Slight ascents alternate with flat passages. There is always the question what to expect around the next bend. Sometimes one just wants to pause to take in the views, but the Lobspitz Massif becomes more and more gigantic and impressive and that makes it almost impossible not to feel the need to get closer and closer. After the round on the Wild Ried unbuckle your skis and enjoy a time-out on one of the benches. At the Montafon Kristberg cable car mountain station you will find heated changing rooms with lockers as well as waxing facilities available for you. We at the Kristberg Panoramagasthof are also enthusiastic cross-country skiers and have created great cross-country package deals for you. Take a look at the offers designed by our Kristberg indulgence team. Because we are a member of the Montafon Aktivclub our guests can benefit from a wide range of discounts, like for snowshoe hikes or taster sleigh rides at half price as well as a 10% discount on toboggan tickets or courses at the Golm Snow Sports School, etc. Cross-country skiing gear (skis, poles and boots) is available for our hotel's guests for free. If you want to spend your winter holiday directly on the cross-country ski run with a great panorama, then the Kirstberg Panoramagasthof is perfect for you. Send us your no obligation holiday enquiry and get closer to your dream cross-country skiing paradise.